Everybody loves a good pirate game, and there never seems to be enough around. With the resurgence of such classics like Pirates! and more recently The Secret of Monkey Island, there might just be some momentum in the genre. 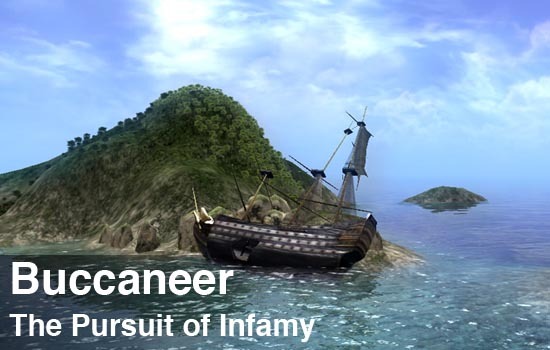 Enter Buccaneer: The Pursuit of Infamy a PC game from independent developers Stickman Studios. It's all the pirate action, without the pirate mess. Aside from the booty, the best part of pirate games are the ship to ship combat, and that is what Buccaneer is all about. 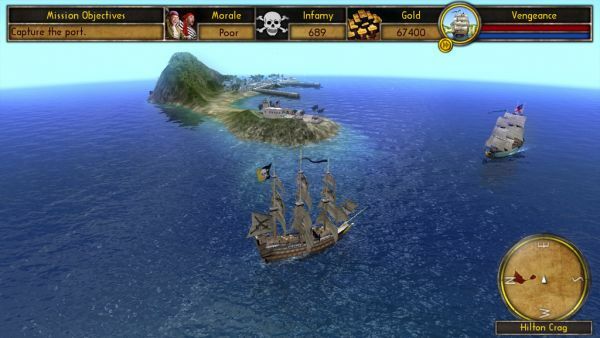 As the name suggests your goal in Buccaneer is to become a famous pirate, sailing the seas and owning the biggest and baddest ship on the block. All the while you'll need to manage your crew's morale, upkeep and upgrade your ship, and of course - get the booty, er, infamy. The single player game starts you on the bottom deck, with the weakest ship and weakest guns; the only way to go is up. Missions are fairly simple from the usual kill all enemies and level their buildings to some more advanced ones like charting out foggy waters for map makers. There's even capture the flag style missions where you need to capture merchant ships anchored in port. The faster and more efficiently you complete a mission the more infamy you'll walk away with. You're dropped into a wide open ocean filled with enemy ships, small islands, and little towns and ports. Each object in the game is brightly colored and pops off the screen, and each little building has even tinier little people on them. Even your boat has a little guy up in the crows nest, it's a nice touch. The water in the game also looks really good, though the draw distance lives a bit to be desired. Ship combat is fairly simple, the left mouse button fires the cannons on the left side while the right button fires the right side cannons. You can speed up and slow down the ship with W and S, and turning left and right with A and D. Each ship has different speed and handling, which at times can be frustrating in the middle of combat. It's all part of the plan to get you to spend your gold on upgrades like more firepower, hull armor and sail quality. Of course if your crew morale is too low it'll be all for naught, so you can share your plunder or buy them rum. With a couple dozen missions at your finger tips you won't get bored. Buccaneer also has a 2 player online co-op mode to play with a friend. The goal of this mode is slightly different than the campaign. Players are presented with a series of co-op scenarios in which they must over take the AI in terms of infamy, after being handicapped. For instance, players will start with 100 Infamy points while the AI starts with 1000. Your goal is to overcome them by sinking ships, destroying buildings, capturing treasure from wrecks and stealing merchant vessels. Oh, and you have a limited time to do that. Each player chooses a ship type, with the bigger and badder ships costing more. If you're sunk, you can respawn, but it'll cost you the infamy cost of that ship. Run out of infamy, it's game over. In all our time playing we found it extremely difficult to win. That's not to say we didn't have fun, but we had to be damn near perfect and devise crazy strategies on the fly to overcome the enemy. We found that one person concentrating on stealing the small vessel and another person concentrating on taking down enemies worked the best. Thankfully if you take a lot of damage you can heal up back at your base ship. If anything, Buccaneer forces co-op play in its co-op mode, probably a good thing. Buccaneer: The Pursuit of Infamy has a lot going for it. The game looks good, sounds pretty good, and plays pretty good. We found the single player mode entertaining with a great mission variety, but the co-op mode just lacked a few things to put it over the top. The good news is the boys at Stickman Studios seemed very receptive of our feedback, and hopefully we'll see some awesome improvements to co-op in the near future. Until then, there's still some fun to be had with the game, and I know we're determined to conquer the co-op mode yet! After all, there's nothing better than sharing booty...er wait. The Co-Op Experience: Each player chooses a ship and sets out to destroy as many opponents as they can. The score can be bolstered by capturing treasure boats, attacking towns, and picking up loot from fallen ships.The Co-op Game itself is broken down into 5 separate mini-campaigns, each containing 4 individual missions. Once a campaign is selected the players are presented with the first mission, which must be completed successfully to unlock the next mission. 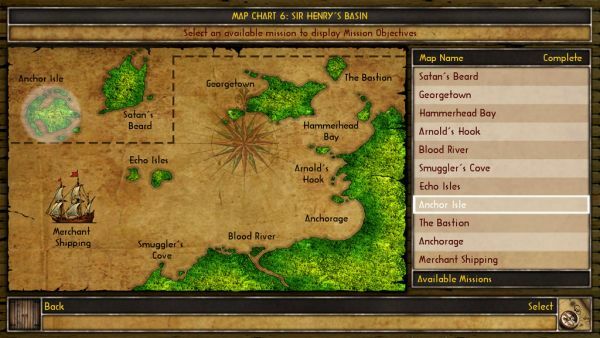 If a mission is failed, the players must retry it and can not proceed with the campaign until they have successfully completed the map they are on. A running score is kept as the players progress through the levels and this will be uploaded to the Hall of Infamy once a campaign is completed successfully. Page created in 1.8740 seconds.